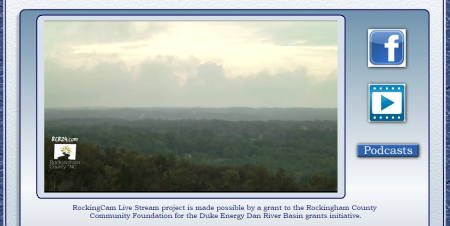 The "RockingCam" is a new livestream showcase of the scenic rural beauty of Rockingham County and a joint project of WLOE/WMYN RockinghamCountyRadio and the Rockingham County Tourism Development Authority. The project was funded by a $25,000 grant from the Rockingham County Community Foundation as a part of the Duke Energy Dan River Basin Fund. More information on the project is available here from the News & Record. The livestream may be viewed at www.RCR24.com or www.VisitRockinghamCountyNC.com.